Rollo is a wonderful young boy who is co-owned, loved and lives with his momma in Western Canada. Rollo quickly finished his CH title and is taking time to grow up. Rollo is a fun, sweet boy; he is easy to live with, and is a quick learner. 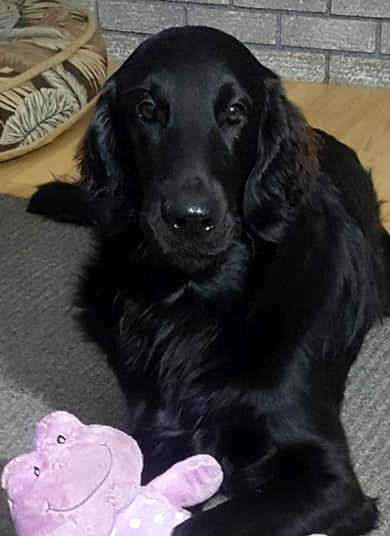 Rollo has kind and playful nature that makes him an excellent "brother" to another flat coated retriever -- both boy's grandsire is our Roman. We are looking forward to seeing what Rollo takes on because he is smart and ready to take on the world in typical flat-coat style. While Rollo is still too young for clearances, inquiries are welcome.